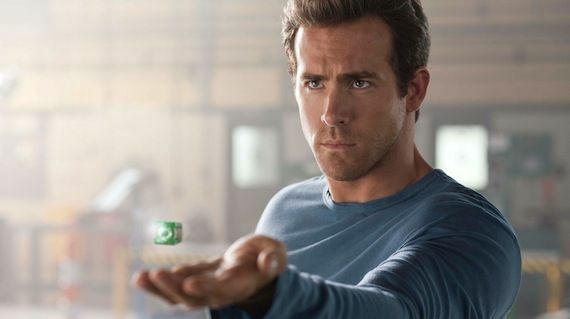 Green Lantern has received fairly poor reviews – it’s at 26% on Rotten Tomatoes – and it ranked third at the box office this past weekend after Bad Teacher. To say that the film has been a disappointment for Warner Bros. is a bit of an understatement. Yet, despite all of that, the studio is apparently moving forward with Green Lantern 2. According to The Hollywood Reporter, sources at Warner Bros. have called Green Lantern a “slight disappointment,” which, in executive speak, means it's an enormous disappointment. Dan Fellman, president of domestic distribution, has said on record that the superhero film was expected to experience a monetary drop-off in its second weekend, as most “fanboy films” do. But Green Lantern didn’t just experience a typical “fanboy film” box office drop-off – it experienced a significant box office drop-off. From $53.2 to $18.4 million, a difference of nearly 66% and enough to allow an R-rated film starring Cameron Diaz to usurp the second place slot. For a film that by some estimates cost about $300 – this includes a $200 (+) million production budget and one of the most expensive ad pushes in history – this is gloomy news, to say the least. This wouldn’t be the first time we’ve heard that there would be a sequel to a superhero film, despite that film lacking financial success. For years, people at Warners insisted that Superman Returns would be getting a sequel from Bryan Singer. Five years later and it's Zack Snyder, not Singer, who is in the process of rebooting the property with The Man of Steel. On the other hand, Ang Lee’s Hulk received mixed critical reviews before underperforming financially – it remains, to this day, the largest opener to never reach $150 million – and yet it spawned a semi-sequel/reboot in the form of Marvel’s The Incredible Hulk (which actually went on to perform almost exactly as well). It would be a massive shame to see the potential of Green Lantern as a cinematic property go to waste, so we hope Warners does follow up with a sequel, a reboot, or some kind of se-boot. The audience doesn’t need to see Green Lantern’s origin again. Heck, just briefly show us Hal Jordan’s origin (man is pilot, man-pilot finds dying alien in a desert, man-pilot gets super-duper ring from alien and joins an intergalactic police corps) in the opening credits, a la Spider-Man 2, then get straight to the meat of the film. Take, for example, The Road Warrior, a sequel that went in a completely different direction from that of its predecessor. It utilized the same character, of course, but had a wholly different style, format, story, and so forth... and went on to out-perform its predecessor in every way imaginable. Who wants to see the filmmakers for a Green Lantern sequel pull a Road Warrior? Anyone? On a somewhat depressing note, it's hard not to notice that the opening box office takes for the past three big-budget superhero films (Thor, X-Men: First Class, and Green Lantern) have steadily declined, and that the second week box office drop-offs have steadily increased. Maybe Green Lantern is just performing so poorly because of the bad reviews and word-of-mouth. But what if audiences are legitimately getting sick of superhero films altogether, as they did in the 1990s with Joel Schumacher's Batman films? It's up to Captain America: The First Avenger to break the pattern. Green Lantern is in theaters now. When we hear more about Green Lantern 2, you’ll be the first to know.